A revised guide to baking whole-grain breads offers a step-by-step approach to the breadmaking process and includes recipes and baking guidelines for making bread from whole wheat, rye, oats, barley, corn, and other beans, grains, seeds, and nuts, and includes a new section on bread machines and original recipes. Original. 15,000 first printing. 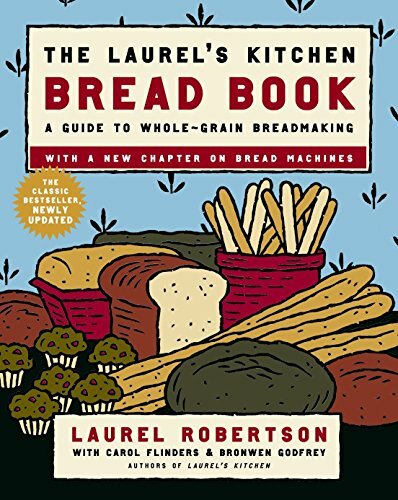 Amazon.com description: Product Description: The Laurelâs Kitchen Bread Book is the classic bestselling cookbook devoted to baking light, healthful, delicious bread entirely from whole grains. This specially updated edition includes an entirely new chapter on making excellent whole-grain loaves in a bread machine. Now even the busiest among us can bake the delectable loaves for which Laurelâs Kitchen is famous. New research proves what weâve known all along: Eating whole grains really is better for your health! Here, the switch from âwhiteâ is made fun and easy. Like a good friend, the âLoaf for Learningâ tutorial guides you step-by-step through the baking process. Youâll make perfect loaves every time, right from the start. Here youâll find recipes for everythingâfrom chewy Flemish Desem Bread and mouthwatering Hot Cross Buns to tender Buttermilk Rolls, foolproof Pita Pockets, tangy Cheese Muffins, and luscious Banana Breadâall with clear explanations and helpful woodcut illustrations. The brand-new chapter on bread machines teaches you to make light âelectricâ loaves from whole-grain flour. No matter what your schedule, you can come home to the wonderful smell of baking bread, fresh, hot, and ready to enjoy. About: A revised guide to baking whole-grain breads offers a step-by-step approach to the breadmaking process and includes recipes and baking guidelines for making bread from whole wheat, rye, oats, barley, corn, and other beans, grains, seeds, and nuts, and includes a new section on bread machines and original recipes.